A manager at a wildlife park where a wolf broke out from its enclosure said pet hamsters posed a greater threat to the public than the escapee. The female escaped at the Highland Wildlife Park at Kincraig on Tuesday afternoon, but was recaptured. Animal collections manager Douglas Richardson said public safety was never at risk. He said: "There is so much mythology about how dangerous wolves are. 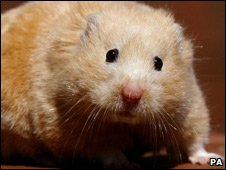 Your average hamster is more dangerous." Prolonged freezing temperatures over winter have been blamed for damaging the wire mesh fence that the wolf broke through. Heavy snow has also hampered the construction of a new wolf enclosure. The escaped animal was shot with a tranquiliser gun and recaptured after it walked into an empty enclosure. Mr Richardson said the wolf did not appear to have affected by the ordeal. He said fairytales such as Little Red Riding Hood have played a part in the mythologizing of wolves. The collections manager added: "There is no authentic account of a healthy wolf either in captivity or the wild attacking human beings. "All the historical material from events in France, Germany and Russia has evidence pointing towards these wolves having rabies, which caused them to attack people as it would with a domestic dog."